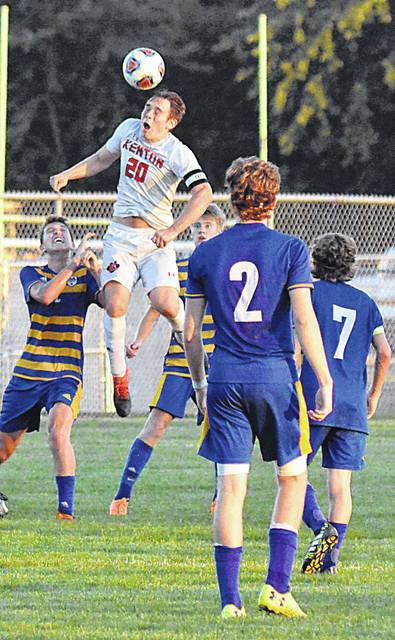 Kenton’s Patrick Bartlett leaps among St. Marys Roughrider midfielders to head the ball in a Western Buckeye League match at St. Marys. Allowing the ball to roll out of bounds for a throw-in, St. Marys Roughrider defender Max Mielke shields the ball from Kenton Wildcat Nick Anderson in a Western Buckeye League match at St. Marys Monday. ST. MARYS – Kenton just came barreling through the midfield and there wasn’t a whole lot St. Marys could do about it. 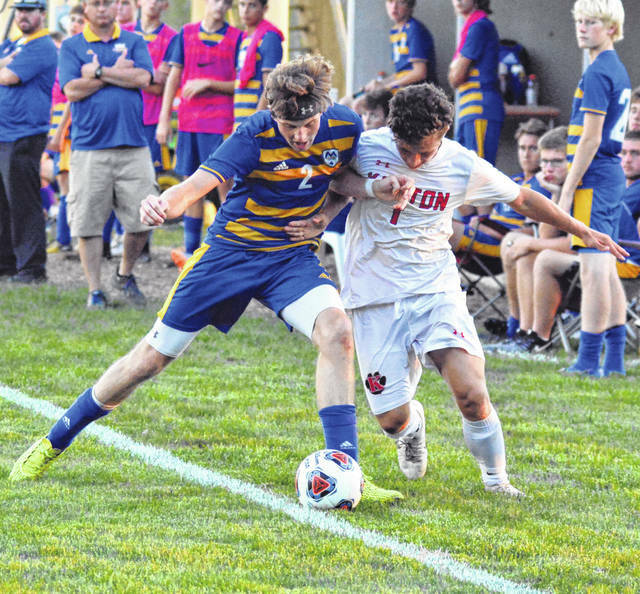 Kenton dominated St. Marys in a 4-0 boys soccer victory Monday at St. Marys. Kenton led 1-0 at the half and pulled away with three second-half goals. Kenton is 7-0-1 overall and 2-0-1 in the Western Buckeye League. Kenton was coming off a WBL 1-1 tie at Defiance. Kenton coach Jamie Bartlett was proud of his team’s complete effort, front to back. It marked Kenton’s first win at St. Marys since 2004. St. Marys is 6-2-1, 2-2 in the WBL. Shawnee sits atop the WBL at 3-0 (nine points). Hicks had two goals for Kenton. Nick Anderson and Patrick Bartlett both scored one. Landon Bartlett, a second team all-state player last year, had two assists. Kenton outshot St. Marys 16-6. Kenton goalkeeper Luke Woodruff had four saves. St. Marys goalkeeper Correy Nelson had seven saves. Kenton controlled most of the first half (7-2 shots), but the score was only 1-0 at the half. The goal came at the 27:18 mark off a corner kick by Landon Bartlett, who lofted it into the goal box. Patrick Bartlett stood in the heart of the goal box and headed it in to give Kenton a 1-0 lead. Hicks’ first goal came on a breakaway after picking up a loose ball 35-yards out. Hicks dribbled down the right wing, entered the 18-yard back and cut back to the left. He connected on a shot from 12-yards out. That made it 2-0 with 37:21 to go. Landon Bartlett then dribbled into the box and reached the top of the right side of the goal box before sliding a pass across the box to a waiting Nick Anderson. Anderson one-timed a shot from 7-yards out and it was 3-0 with 27:26 to go. Hicks again scored on a breakaway into the box to make it 4-0 with 3:20 to go. Defensively, the Wildcats were steady with center defenders Patrick Bartlett and Isaac Mendez leading the way. Kenton seemed to gobble up every loose ball in the final 20 minutes. https://www.limaohio.com/wp-content/uploads/sites/54/2018/09/web1_stmarysvskenton006-1.jpgKenton’s Patrick Bartlett leaps among St. Marys Roughrider midfielders to head the ball in a Western Buckeye League match at St. Marys. https://www.limaohio.com/wp-content/uploads/sites/54/2018/09/web1_stmarysvskenton008-1.jpgAllowing the ball to roll out of bounds for a throw-in, St. Marys Roughrider defender Max Mielke shields the ball from Kenton Wildcat Nick Anderson in a Western Buckeye League match at St. Marys Monday.